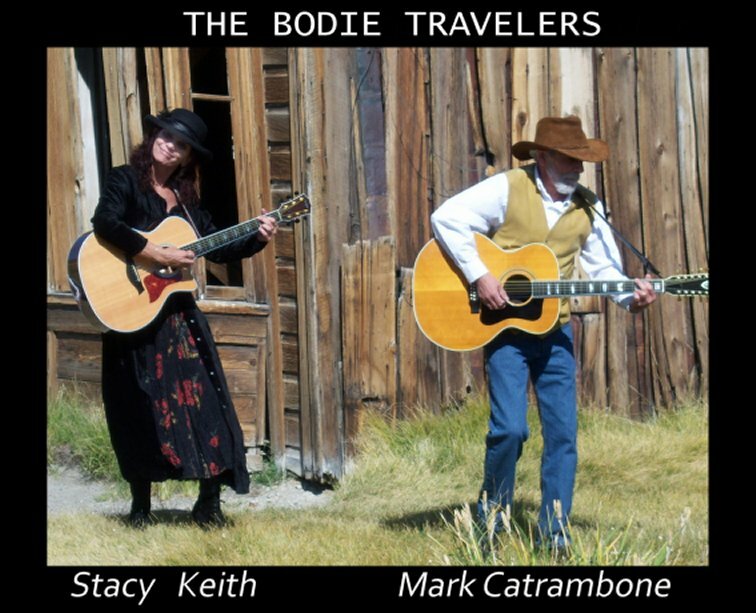 "A Soulful and Original Sound"
The Bodie Travelers, featuring Stacy Keith and Mark Catrambone, blend seamless harmonies, signature picking styles, and soulful harps, to deliver, award wining originals, traditional and selectively hand picked tunes. "You'll hear the music long after the songs are sung"
June 11 2011 - OUTRUN MS-LAGOON VALLEY 2011, Lagoon Valley, Vacaville, CA - The Bodie Travelers will perform a 2nd benefit at Pena Adobe Park at 2:00 p.m. during the Outrun MS-Lagoon Valley 2011 event. An amazing day for getting out and raising monies again this year for the National MS Society! Family and friends will be enjoying plenty of live music, arts and crafts and food vendors in beautiful Lagoon Valley! Please support us and come out for a great day! August 27 2011 - CLARDY GUITAR CELEBRATION PARTY, Burns, TN. - The Bodie Travelers will perform at Clardy Guitar Celebration Party. Bar-B-Q Lunch and music of all genres starting at 1:00 p.m. (Open 12:00 p.m. to 8:00 p.m.) Music from Flashback, Gary Payne, Gary Clardy, Diperent Rendition, Jesse Clardy, JP Clardy, The Bodie Travelers, TRock (Tony Stovall), Geoff Roehm and many more. Mr. Clardy will be shooting video of the show, as well as, audio recording and streaming the days events on Ustream! Location 3041 Hwy 70 East, Burns, TN. June 2 2010 - Historic Downtown Vacaville Town Square, Vacaville, CA - The Bodie Travelers will be performing at the Historic Downtown Vacaville Town Square on Wednesday, June 2nd, from 11:30 a.m. to 1:00 p.m. Grab some lunch at one of their 24 restuarants and enjoy some great music! July 31 2010 - Lagoon Valley Regional Park, Vacaville, CA - The Bodie Travelers will be performing Saturday, July 31st from 2:00 p.m. to 3:00 p.m. at the “Outrun MS” Benefit Event at Lagoon Valley Regional Park, Vacaville, California. Music – Food – Refreshment – Raffles & More. The Event is to benefit the National MS Society. For more information: www.outrunms.org. Come out and enjoy some great music! Aug 12 2010 - Off the Track Cafe, Forestville, CA - The Bodie Travelers will be performing at the newly opened "Off the Track Cafe" with an evening performance on Thursday, Aug 12th, from 7:00 p.m. to 8:30 p.m. in downtown Forestville, CA. The Cafe, located at 6544 Front Street in Forestville, proudly serves speciality coffee drinks, gelato, smoothies, paninis, salads and much more. Come out and enjoy some great music! May 16 2009 – Vacaville Wine Stroll – Vacaville, CA – The Bodie Travelers will be performing at Historic Downtown Vacaville for the Vacaville Wine Stroll event. Get out and enjoy a day of food, drink and song in beautiful downtown Vacaville. Performers include The Bodie Travelers, Amy Meyers, Mary Redente, Grace Woods, Kit & Tanya and more. Come stroll with us! Aug 11 2009 - KSVY Radio Show - Sonoma, CA - The duo will appear on the "Dance Diva" show, with host Beth Hadley, from 8:00 to 9:00 p.m. The show is broadcast live on KSVY 91.3 FM and streamed on ksvy.org (click on listen now). Aug 22 2009 - Cur-ville 4th Annual Dog Days Fest - Music will rock the Rockin' Heart Ranchito in Kenwood CA from 2PM to 9PM, with lots of Jammin late into the night. The Sweet and Spicy line up includes The Bodie Travelers, Three at Last, Larry Potts, Solid Air, Mayne Smith and Johnny Harper, Adam Traum Trio, Michael McNevin, Doug Blumer and Friends, Ed Hance and Dale Henry Geist. Bring the kids, bring the dogs, bring the instruments...and prepare for serious wine country fun!! Check it out at http://www.cur-ville.com/ or contact us for ticket info. Dec 26 2009 - KSVY Radio Show - Sonoma, CA - The duo will be featured on the "Rootstock and Vine" show, a tour of American Roots Music, with host Michael Castle, from 5:00 to 7:00 p.m. The show is broadcast live on KSVY 91.3 FM and streamed on ksvy.org (click on listen now) at http://thmm.com/ksvy/?cat=54. More to Come! - This summer, we performed in Sweetwater, Colorado; and on to the dusty and wild Annual Bodie Days celebration; from the Rockin' Heart Ranchito Kenwood stage at the Cur-ville Festival, to (the privilege of me accompanying Stacy at) the magical stage of The Mystic Theatre. We performed on 3 radio shows and had the opportunity to perform along with Suzy Bogguss and Gretchen Peters and many others at the Vacaville Art Wine and Brew Festival. And between it all, we completed our first CD, "Backroads." - And so now...Stacy and I are taking a well deserved b-r-e-a-k. It's been a blast of a musical summer for us. We going to settle into more music over the winter. Thank you all for listening to our music, being our friends and for supporting what we do. We're really looking forward to bringing you more music in the months ahead ... and sharing a few brews with you along the way.